Traction Bars! The Way to Eliminate Axle Wrap! 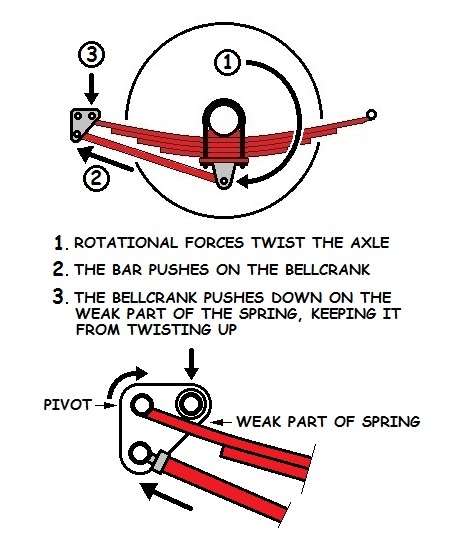 Traction bars were created to cancel the effects of axle wrap. Axle wrap can happen to leaf springs under hard acceleration. (When you drop the hammer...) The torque from the rear axle can try to twist the leaf spring into an 'S' shape. As the spring snaps back, it can cause wheel hop. One way to fix this is to use traction or 'slapper' bars. 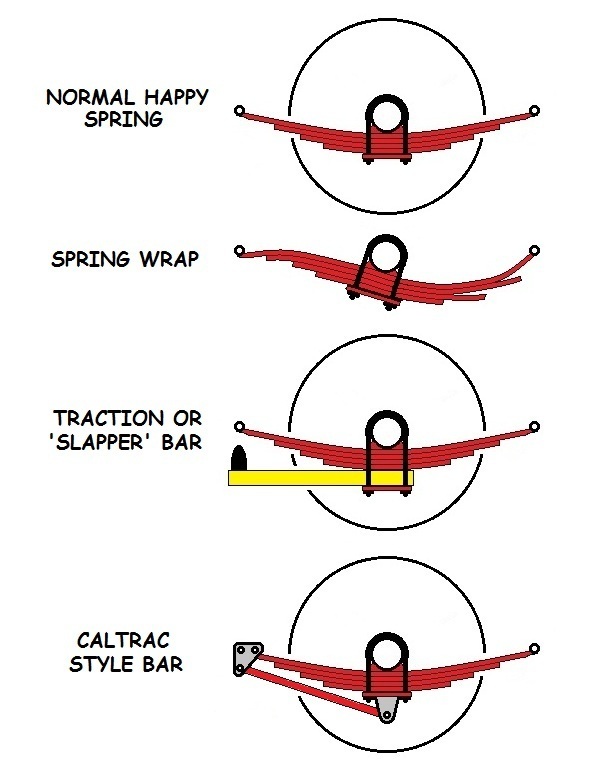 Another method is to use the 'Caltrac' style traction bars. 'Slapper' bars work by stopping the twist of the rear axle. As the axle tries to twist, the bar twists up and comes into contact with the leaf spring 'eye'. This stops the twist of the axle and spring and makes the tires dig in and go. The rubber snubber needs to contact the spring 'eye'. Some manufacturers just let them hit the spring, but that is the weak point of the spring we are trying to save... Many springs have been bent by incorrect snubber placement. So either get the right traction bars for your particular model, or you can lengthen or shorten yours to work correctly. 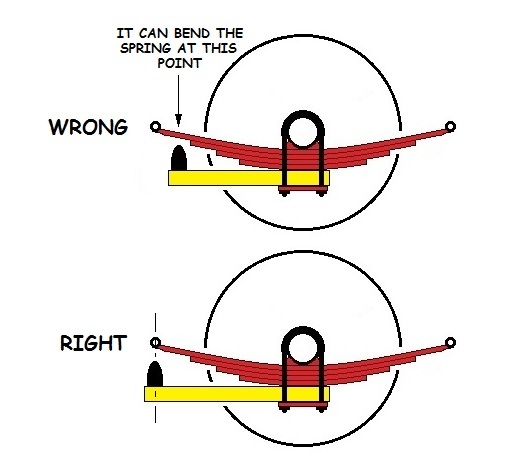 The distance from the rubber snubber to the spring eye can usually be adjusted. Taller or shorter snubbers can be bought or you can cut them shorter or add a spacer to make them longer. The less gap you have between the snubber and the spring eye means the bar will react more quickly but less aggressively. It will also make the ride much firmer. The more gap you have the slower but more aggressive the traction bar will react. This also results in a much softer ride. 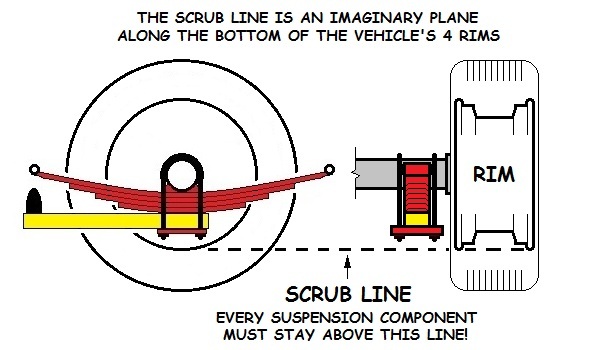 In drag racing there usually isn't any gap between the spring and the snubber because you want the traction bar to work as soon as you get on the gas. However this makes the rear suspension much more stiff. Not something you want on the street. Adjust the rubber snubber for a softer or firmer ride. Start with a half-inch to an inch from the leaf spring. Then you can adjust from there. 'Caltrac' style bars work differently, but end up with the same reaction. They stop the twist of the axle and spring and make the tires dig in and go. Now get out there and make those traction bars work for ya!